In August 1921, Roosevelt contacted an illness that left him paralyzed from the waist down. 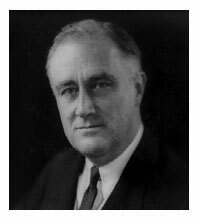 Nevertheless, Roosevelt became President and stayed President for four terms. Due to the prejudices of the times concerning disability Roosevelt tried to hide his disability; he fitted his legs and waist with iron braces that allowed him to walk short distances with the use of the cane, and he only used his wheelchair in private. This allowed the public to see Roosevelt for the man he was and his policies whilst he was in power rather than focusing on his disability.